The BIGBLUENETWORK has moved to WPEngine. Why did we switch from a dedicated server to a managed host? Simple. For better performance. WPEngine has tuned their servers and optimized performance for WordPress-powered sites. What kind of performance kick did we we see? It was amazing. This chart shows the response time for one of our sites. The high points show the slower response time we were getting with our dedicated server. 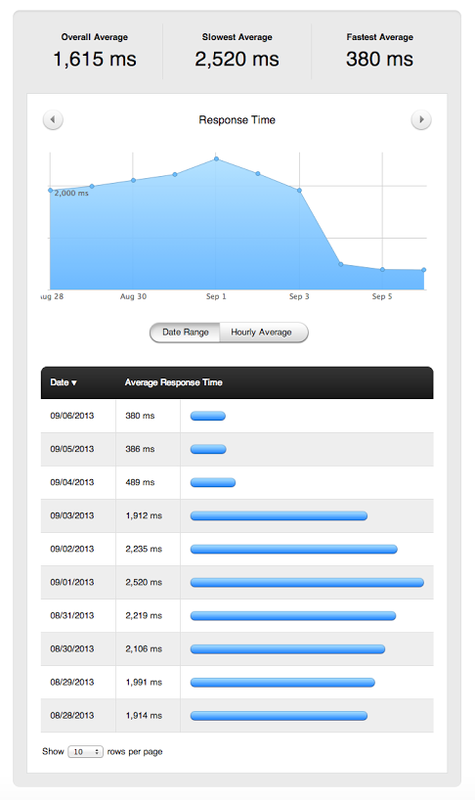 The low points show the drop in response time after migrating to WPEngine. That’s a 4x improvement in response time! We had similar results in page load time. The bottom line? All of the sites in the BigBlueNetwork are now cranking out goodness on the interwebs faster than you can blink. If you have a website, contact Room 5 Productions to find out how we can help you gain the same benefits. Or if you’re web hosting savvy, check out WPEngine for yourself. At the Southern California Vibe we explore Southern California one weekend at a time. We share what we find and tell you what’s worth checking out. SoCal Hiker provides detailed guides to hiking trails throughout Southern California…and beyond. We share advice on gear, local hiking events and training tips. Are you sick and tired of “Top 10” lists that don’t really help you make decisions that will improve your life? That’s a pet peeve of mine, too, and I’m doing something about it. No more crap about the myriad of choices out there. Just the best choice. The right choice. The one fill-in-the-blank that rules them all. And all of them are vetted by us… through personal use and experience. These are the tools, the gadgets, the apps, the websites and the lifehacks that we use every day. No bull$&!t. Just good advice for better living. Travel Novice is designed to help you by connecting you with fellow travelers who have been there. We don’t try to be everything to everyone, we simply share our own practical experience. You can take our real itineraries and use them as you see fit. They are what we used. Will they work for everyone? No, but you’ll likely learn a lot of great tips that you might not pick up from the guidebooks and big travel sites. That’s what Travel Novice is all about… real travelers sharing their real experiences. GetGamer is a community of gamers sharing reviews and tips on video games. Covering online gaming, PC, console, handheld and mobile game apps. Room 5 Productions is a full-service web design and development firm that builds everything from basic company web sites to collaborative intranets, shopping carts, and complete online communities. Their design and development expertise will help you achieve your goals and set you apart from the crowd. I started the BigBlueNetwork out of my passion for building meaningful online communities. I am always looking for ways to help people build connections that enrich their life and those around them. Our collaborators and co-conspirators are located throughout the world, from Indonesia to Spain; from Canada to Chile. Our home base is Los Angeles, California. Interested in creating or building your online community? We'd love to hear about it! Want to keep up with what's going on at the BigBlueNetwork? Follow us.